The question of “would you prefer a big class or a small class?” was first proposed to me in my sophomore year of high school. My brother was visiting multiple colleges at the time, and I was tagging along to get some college experience for myself. First, we visited Penn State University Park, and we both loved it. As many of you know, however, the class sizes here are considered very large. Penn State ensured all the visitors that the instructors do a great job, and there are TA’s so class size is never an issue. My brother then visited a much smaller school with only about 1,500 students. On that visit, the tour guides preached about the small class size and the face to face interaction you get with the professor. Since that visit, I have been wondering if class size really makes a difference in your learning experience. My personal opinion on this issue is that class size does affect how you learn. In this case, the null hypothesis is that class size has no affect on learning. The alternative hypothesis is that class size does affect learning. This study was performed state wide in Tennessee. It randomly put students and teachers into either a large or small class and had them remain in that class for 2 years. It then tested the students at the end of the year to see which class size performed better. According to the study, it was a decisive win for the smaller class size. This study claims that class size has a very big effect on learning, and it would reject the null hypothesis. I have a few concerns about this study, however. My first concern is that the results could be a false positive. The kids in the smaller class may just be smarter than those in the large class. The smaller class may have had a better teacher, as well, which allowed them to perform better on the test. The experiment has some inconsistencies that could make the results flawed. This article shows more possible inconsistencies within the study. I would make a few changes to improve this study. First, I think you should have the same teacher teach both classes. By doing this, there is more consistency in the experiment and equal teaching to both classes. I also believe the experiment should be performed on different age groups as well, not just kindergarten. This would increase sample size and show whether or not the results are consistent throughout grades. In the end, I do not believe the results of this particular study are credible. I believe more research and better experiments must be done before the true answer is known. If you are deciding between colleges with differing class sizes, no matter what people say, it comes down to what you prefer and are comfortable with. I do not believe a rational person should force themselves into smaller classes to improve their learning based on this study. This entry was posted in Uncategorized on December 1, 2016 by Brett Alan Merritt. I completely agree with your point that it’s up to the individual person to decide if they feel more comfortable in a small class or a big class. I know I always feel more comfortable in a big class and feel like I learn the most in them rather than in smaller classrooms. I found this article (http://www.seattletimes.com/seattle-news/education/does-class-size-matter-research-reveals-surprises/) that also discusses whether class size effects students ability to learn and perform well. This is a very interesting article. 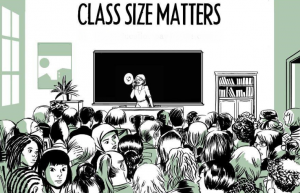 I personally believe that class size does not have an effect on learning. Either way, you just have to focus on what the teacher is saying. Yes, it is harder to ask questions in a larger class, but I usually right it down and ask a TA. Some people have very different opinions than me, though. There are people who won’t even consider going to large schools because they do not want large classroom settings. It is really just a matter of opinion. Most people prefer small classes than large classes. Here is an article which describes some more benefits of small classes. I was really intrigued by your post because I have a much better grade in my class of 20 people than I do in my class of 700+ people, and was wondering the same thing. It seems like you have researched this topic a lot and I can tell by the way you thoroughly described the study. I liked that you brought up that the study could have been tweaked a little, and that just because there was one result from this, there is no definite answer. I agree that it should have been with other groups besides kindergarteners because it affects students from all ages. I am glad you presented this piece and bringing into account the matter of subjectivity of what the individual prefers in their learning experience. Also, i think you were spot on with the suggestions for improvging the study. Too much change wont give you an adequate comaprison. What you sort of alluded to in your paper was a sense of personal satisfaction with the class, but something I would throw a monkey wrench into the discussion and see what that would be like for maybe an online class. How does student satisfaction play into an online class where interpersonal activity with someone else isn’t really a factor and they have access to a professor (electronically, of course) whenever they want.